Several people have mentioned stuff coming up that's easy to do and important to keep an eye on! Will have limited or non-existence DNR review and oversight. Allow the removal of woody debris, trees and other fish and habitat structures. Allow dredging in up to 5 feet of water. May hasten the spread of invasive species between and across lakes. No notification of dredging to neighbors even though their lakeshore could be negatively impacted. Destruction of endangered species. Untrained individuals (home owners can fill out application forms so they have to state that there are no endangered species in the dredged area. However, unless the home owner is also an aquatic biologist they have no way to accurately identify plant, invertebrate or other species as potentially endangered. Because this is a permit and not legislation the only way to stop is to flood the DNR with comments opposing this permit. Contacting our legislators won’t work. These groups are trying to exploit a loop hole in the law that is designed to help projects like the Tree Drops on Lake Menomin to create a state wide environmental disaster. This permit is being promoted by a company that dredges lakes, the builder’s association and the realtors. If you would like more information, call Wisconsin Wildlife Federation District 3 Rep Jim Swanson at 715-232-8266. A recent study showed 18 percent of all wells in the state are contaminated with bacteria that indicate the presence of disease-causing organisms. Learn more. When a group representing some of the state's biggest polluters directly interferes with policies that determine the quality of our drinking water, it's time to fight back! The Dairy Business Association (DBA) has had its say with Gov. Walker, now we need to make sure our voices – and the voices of families who can't drink their water – are heard. That's why we need you to join us at Conservation Lobby Day on March 29th. Register here to make your voice heard on March 29th! Dozens of wealthy, powerful special interests run the DBA – and its priority is to ensure factory farms continue to operate with as little oversight as possible. Gov. Walker has repeatedly colluded with this group to loosen any attempt at protecting drinking water even as manure poisons families across the state. Last week, Walker’s budget proposal included a directive to evaluate moving regulation of factory farms out of the DNR. That terrible idea would make enforcing clean water rules even more difficult. 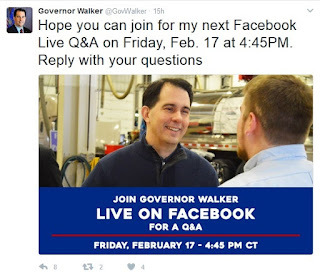 The DBA presented it to Walker’s staff weeks before he released the budget. Register here to join hundreds of fellow conservation voters on March 29th! This type of direct influence is causing a public health crisis in places like Kewaunee County where water flows from taps brown and smells of manure. WHERE: Monona Terrace, Exhibition Hall A and the State Capitol (see map). Join us for a day filled with valuable information, meetings with lawmakers, and fellowship with the conservation community. For more information, visit our website.